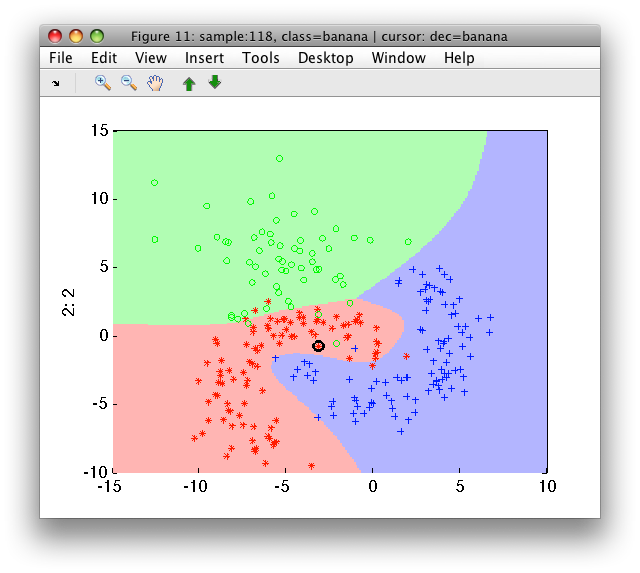 This section describes neural network classifiers. perClass sdneural function provides two types of neural networks, namely the feed-forward (multi-layer perceptron) and radial-basis function (RBF) networks. The sddeepnet command implements deep convolutional networks. The provided data set is split into training and validation subsets (80%/20% by default). 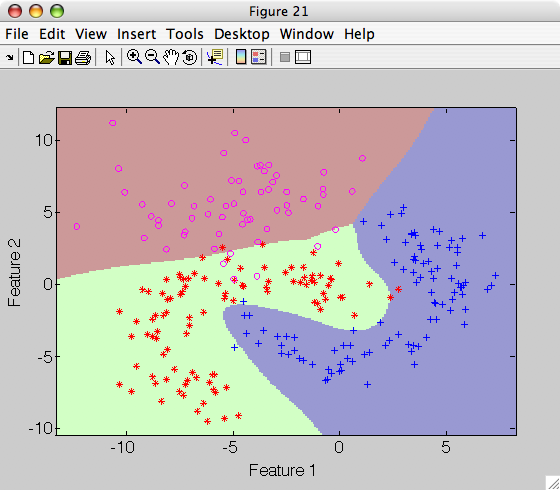 The training subset is used in optimization and the validation subset to estimate the generalization error. The validation fraction may be changed using tsfrac option. 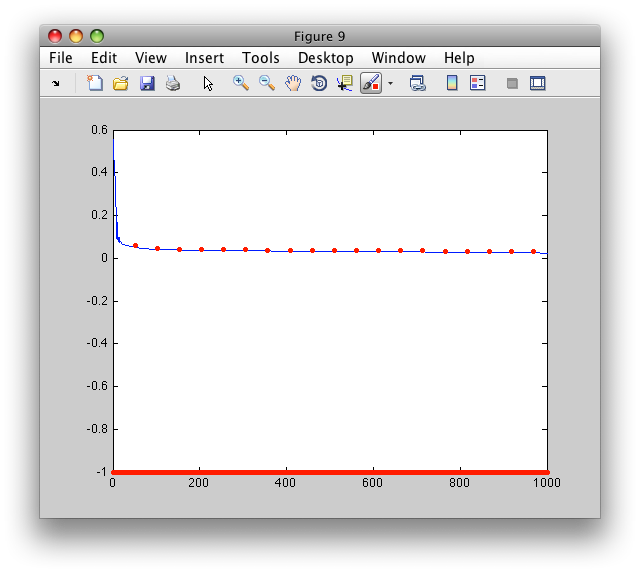 Eventually, sdneural returns the network with lowest mean square error (MSE) on the validation set. Thanks to this approach the sdneural does not over-fit training data when trained for a large number of epochs. The res.Etr and res.Ets fields contain training and test mean square error during the optimization process. We may observe that the test error is not estimated for each iteration. The step is controlled by the 'test each' option. By default, 100 is used. It is useful to scale the training data set passed to sdneural to avoid long optimization process (the network does not need to learn the scaling). Therefore, by default sdneural performs scaling using sdscale. In some situations we may wish to disable this internal scaling. For example, we scale the data ourselves. We may disable scaling using 'no scale' option. Neural networks belong to algorithms that may be trained further. This is useful for on-line training where more labeled training examples are available later. Neural pipeline action expected, got 'Decision'. Provide only the neural step. Note, that because our classifier p contained the scaling step, we must also make sure the data passed to the network for further training is identically scaled. Therefore, we provide the scaled data set a*p(1) as the training set. Also, we disable scaling with 'no scale' option. An alternative is, of course, to scale our data set outside and switch off scaling in all network training using the 'no scale' option. Alternatively, the 'units' option may be used: sdneural(data,'units',10). The 11 outputs now correspond to 11 units. With sdscatter(a,p), we may see all per-unit outputs (use cursor keys). sdneural implements a direct formulation of RBF training algorithm which is suitable to large data sets. Elapsed time is 121.792478 seconds. Two minute training for a data with 37k samples and 103 dimensions is not too long (2.8 GHz Intel Core 2 Duo CPU). perClass includes support for deep convolutional networks trained using sddeepnet command. It is built on top of Matconvnet toolbox. 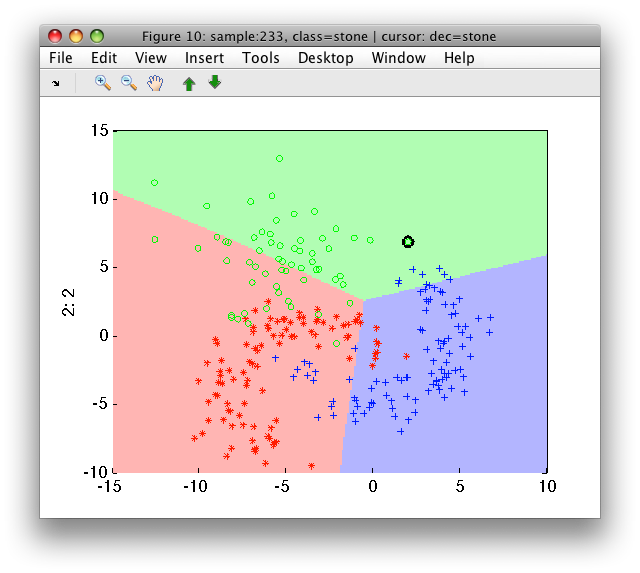 It allows to train classifiers on image data. As perClass bundles Matconfnet build, there is no extra installation step needed to use deep learning. By default, optimizer binaries are built with CPU support that works on all platforms. To use GPU, one needs Parallel Computing Toolbox and NVIDIA graphics card supporting CUDA. When invoking sddeepnet command for the first time on supported platforms, the mex binaries with GPU in perclass_install_dir/matconvnet/matlab/mex.gpu are put on Matlab path. As of perClass 5.1 this holds for Linux 64bit. It is also possible to point sddeepnet to custom-built matconvnet binaries with matconvnet option. The path provided should point to a directory where matlab/mex and matlab/simplenn directories are located. To find out exactly what binary build of matconvnet is used, check Matlab path after first call to sddeepnet. The data sets for training provide images, reshaped to the same image size. 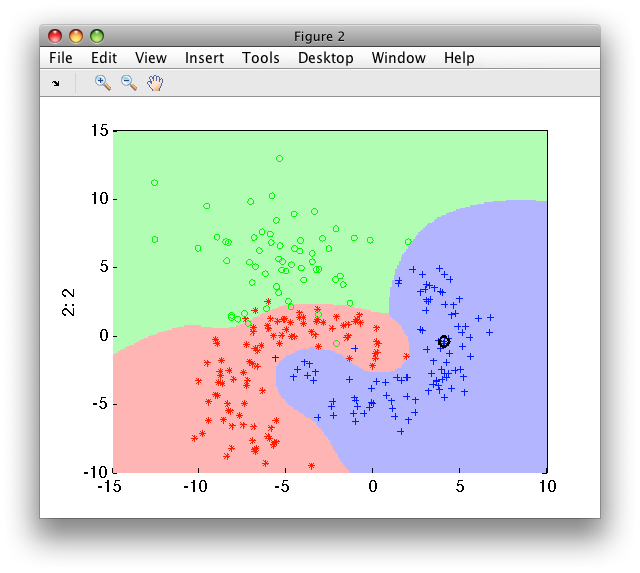 Therefore, each data set feature corresponds to one pixel. The data set is supposed to contain the imsize data property specifying the image height, image width and, optionally, the number of channels. Note: If your data set does not contain the 'imsize' property, you may add it with setprop. Note the 'data' option in the end: It is needed as the 'imsize' property is a property of the entire data set. convolution. Provide kernel size, filter bands and number of filters (outputs). Example: 'conv',[3 3 1 10]   means 3x3x1 filter, 10 times. You can see, that sddeepnet command shows us, for each layer of the network, the sizes of input and output image and filter details. The architecture is still incomplete, because we need to go down to 1x1x(number of classes), in our case 10. The architecture is now complete, as we have 1x1x10 output. We can specify the number of training epochs and execute the training. During training, a GUI figure shows progress. In the upper part, information such as epoch, batch and training settings (rate/batch size) are noted. The best validation-set error is also shown. 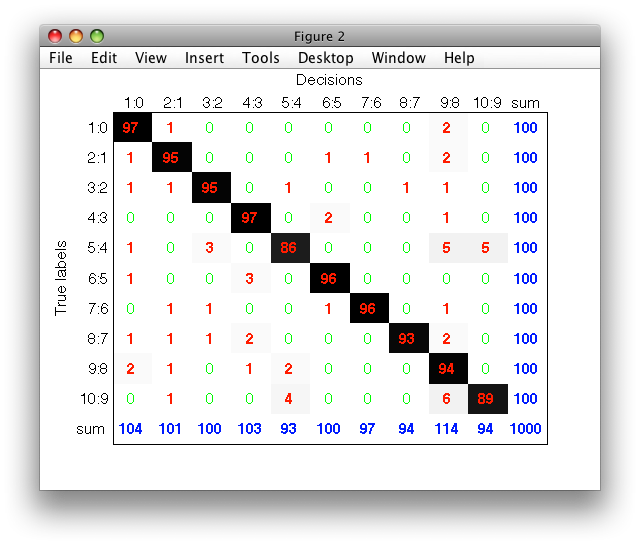 In the middle part, we can see optimized criterion on the left and error on the right side, each with training set error in red and validation set error in green. The best validation-set result so far, is highlighted. This is also the solution returned form the network. 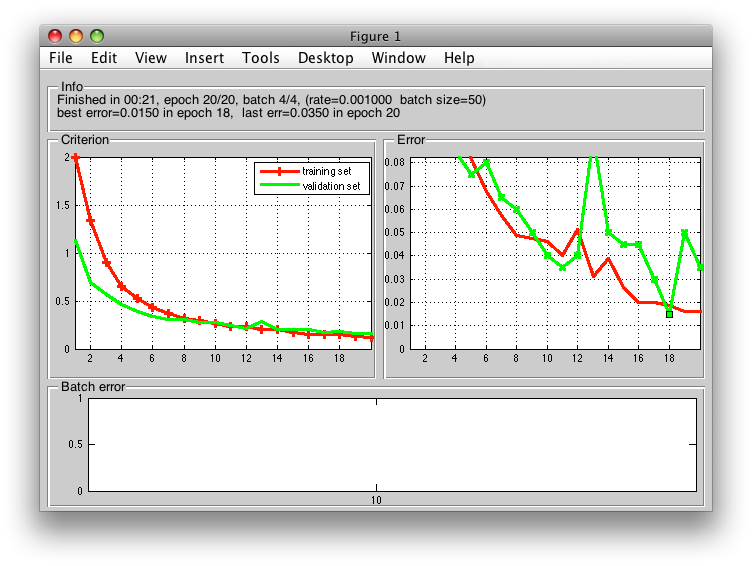 In the bottom part of the GUI figure is shown the progress in terms of batches (training in red, validation in green). The sddeepnet returns a standard perClass pipeline that can be directly applied to any data set with correct number of features (in out case 256). In our case, we found a better solution. As the second argument, sddeepnet provides detailed information about the training process. In order to make sddeepnet training repeatable, fix the random seed. This will make sure that exactly the same data splits are used internally. It is possible to provide custom training and validation sets split externally. In the example below, we use a simple random subset. In practice, we may want to split not randomly, but based on a specific label e.g. making sure that validation examples originate from different set of images that training examples. We may suppress opening the GUI window while training with 'nogui' option. Details on the training process are then displayed in the command window. Each time a new best error on the test set is reached, it will be displayed in the left-most column. In this way, we have a quick overview of training progress. Each 10% of epochs, an estimated remaining training time is displayed. Summary information is provided at the end. Convolution layer implements a filter sliding through the input image. The filter is a 3D matrix, width x height x number of channels. Only square kernels (width = height) are supported in perClass 5. The fourth parameter specifies how many filters are to be trained. Optionally, a fifth parameter may be provided specifying a step within the input image. A. Use the same number of channels as the outputs of the previous layer. The fifth layer uses kernel 5x5x15 with 15 channels, because previous layer provides 15 outputs. B. Use smaller number of channels than outputs of the previous layer. In this setup, "filter groups" are formed. The number of outputs of the previous layer must be divisible by the number of channels we request. The fifth layer defines 5x5x3 filter. The output of previous layer is 15 which is divisible by 3. Therefore, we will obtain 5 filters groups (15/3). Note, that the number of outputs of the fifth group must be a multiple of 5. In our example, it is OK because we ask for 20 outputs. Therefore, we will have 4 filters per group (20 outputs/5 groups). Filters F1,F2,F3 and F4 are trained on the first three outputs of the previous layer. The the filters F5,F6,F7 and F8 are trained on outputs 4:6 of the previous layer and so on. Fully-connected layers are created with 'conv' option making the output size equal to 1x1 pixel. Batch normalization layer uses statistics of individual batches to re-normalize outputs of the previous convolutional layer. It does not have any parameter and does not alter network geometry. Maximum pooling uses spatial maximum filter and outputs maximum value of previous-layer outputs in each neighborhood. It is applied independently to each channel. Rectified linear unit is a simple transfer function that turns all negative values in zero and lets all positive values pass through. It is known to significantly improve convergence speed. Drop out layer is active only in training. It is used to randomly disable some training neurons and so limits over-fitting. Training of sddeepnet convolutional networks is handled by Matcovnet toolbox. perClass 5 bundles the Matconvnet build with binaries for 64-bit platforms. Therefore, there is no extra installation step needed in order to use deep learning in perClass.